Burglary statistics in the U.S. are pretty staggering. Did you know that a home gets broken into about every 18 seconds? That adds up to nearly 5,000 burglaries in the U.S. every day. This blog post is intended to help you better protect your home, valuables, and of course, your family. Here are 10 ways to improve the security of your home. Change your locks – When was the last time you changed your locks? It’s best practice to do so whenever you move into a new house since you’ll never know who had access to the keys before you moved in. 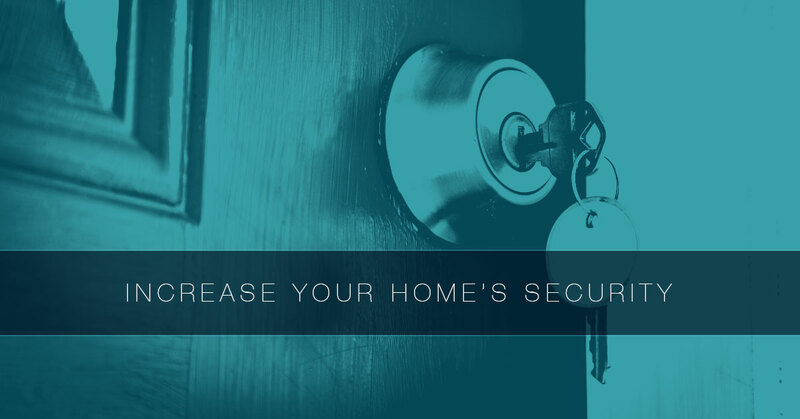 Be sure to also replace your locks whenever you lose a set of keys to your house. Conceal all wiring – A smart burglar will look for wiring around a home’s exterior so they can cut and disable the security system. That’s why it’s important to keep your home security wires hidden. Give the impression that your home is occupied – Not surprisingly, burglars tend to focus on homeowners who are away for an extended period of time. You might want to consider automatic timers to turn porch lights on and off while you’re away. Avoid leaving your key in the mailbox – You’ve probably gone on vacation in the past and left a house key to be available for a friend or family member to check in on occasion. Just remember to place your key in a spot that wouldn’t obvious to potential burglars, such as inside a mailbox or beneath a placemat. Light up your home’s entrance – Quality lighting may be the best deterrent to burglars. For example, lighting with an infrared detector automatically turn on when someone enters a specific zone. Install deadbolt locks – Spring latch locks may be cheaper, but think of deadbolts as a better investment for your family’s safety. It’s recommended that all exterior doors have at least one-inch thick deadbolt locks. Protect your windows – As the weather gets warmer, burglars search for open windows as an easier way to break into homes. But even closed windows won’t stop the most daring of burglars. You may want some added protection with window locks and burglar-resistant glass. Install a high-quality alarm system – You can do all of the previously mentioned and still have your home broken into by a burglar. It’s why more and more folks are having alarm systems installed. They typically warn homeowners of potential dangers, immediately inform emergency authorities, and can even prevent an intruder from attempting to break in altogether. We are excited to have partnered with Terrell Alarm Systems as of February 1, 2017. For the past few years, we teamed with them for project work, but we are incredibly pleased that this relationship is now official. Terrell Alarm Systems handles all of our home security, business security, fire alarm systems, access control systems, camera and surveillance systems, as well as monitoring. Many of the systems are integrated within all our automation features and products for remote viewing, in addition to remote arming/disarming and control. When we work with Terrell Alarm Systems, safety and security are always at the top of the list. Rest assured that our work abides by the Texas Department of Public Safety security license number of BO9970 and the Texas State Fire Marshal’s Office license of ACR 1750867. Customers tend to recognize our company solely based on our luxury home theater systems. While we take great pride in creating a beautiful, customizable home cinema experience, we can also keep your home safe thanks to Terrell Alarm Systems. From home theater design/installation to security services and more, let us take on that next project. Contact us today.